The new Thera-Band® Latex-Free Professional Resistance Bands were formulated to match the pull forces of our existing Latex Resistance Bands! The new formula also delivers no scent and no powder for ultimate comfort and satisfaction. 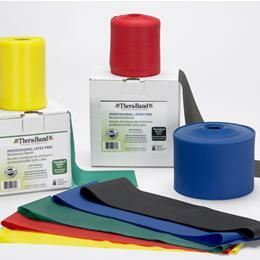 The only Latex-Free Professional Resistance Bands that match the market-leading Thera-Band® System of Trusted Progression. Together, these products form one system that meets all patient needs. Meets the needs of patients and practitioners with latex allergies. The best option for facilities and hospitals with a “no latex” policy. Matched / Identical Pull Forces to Thera-Band® Latex identical performance to Thera-Band® Latex that practitioners have used and trusted in their practice for 30 years. Identical Colors to Thera-Band® Latex-easy to recognize Thera-Band® Color Progression.